It's us! The Denny's Chicks! And we're actually at Denny's! Waiting for our breakfast. 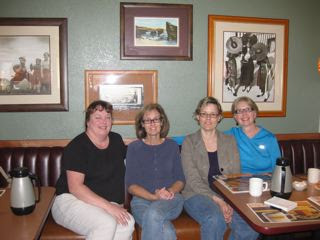 From left to right: Kathy, me, Kelly, Sandy. You have to admit we are probably the best part of the decor! 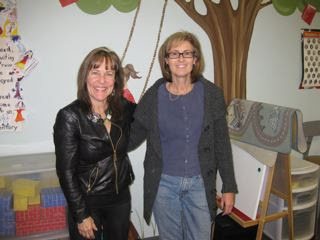 My name is Kelly Hayes and I met Barrie several years ago at an RWA-San Diego meeting. Shortly thereafter we attended an RWA plotting bootcamp where Barrie and I shared a hotel room and partnered with Kathy Krevat for the whole session. We shared lots of caffeine and even more maniacal laughter. I still feel sorry for our poor fourth partner who no doubt thought we were insane. That night, Barrie and I plotted into the wee hours and came up with some great stuff. Or so we thought under the influence of too much green tea. (Uh, Kelly, it WAS great stuff!) It was the beginning of a productive, if at times slightly wacky, writing friendship. Soon Barrie wrangled (translation: gently persuaded) Kathy into forming a critiue group with us and Kathy in turn wrangled (translation: well, actually, "wrangled" pretty much covers it!) Sandy. We started meeting at Denny's and the rest is history. I work at a local library where I run the library book club. So I spend a lot of time talking about books. Uh, Kelly, you forgot to mention how INCREDIBLY ARTISTIC YOU ARE! 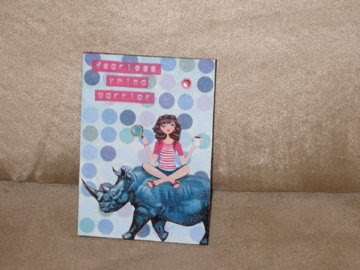 Below is a card Kelly CREATED for me. It's got all sorts of elements from I So Don't Do Mysteries. And here it is again next to a $1 bill, just to give you some perspective. Besides being super artistic, Kelly's an excellent baker, reviews our manuscripts with a fine eye, has a delightful understated sense of humor and is always on time! Can you say EXCELLENT critique partner. And, uh, no, you can't have her. I’m Sandy Levin, the oldest Denny’s Chick (Note from Barrie: but still very very cute) and the last to join this wacky bunch of writers. 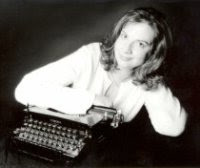 I’ve been writing most of my adult life, but I focused on romantic suspense about ten years ago. Since then, I’ve completed four manuscripts but remain unpublished. I’ve started a number of other novels in different genres and tried my hand at non-fiction, but my muse has gone into hiding. Denny’s Chicks have been very supportive of me in my dry spell. This past year I’ve been plagued with a series a health problems, so my writing has been limited to blogging at Peaceful Heart Stained Glass. When I’m not blogging, I’m teaching yoga and creating stained glass. I find that practicing yoga and meditating while creating beautiful stained glass works of art keep me stress free. I love being a part of this group. While we are all friends, we are all professional when it comes to writing and critiquing. Here’s a sneak peak into how we operate. 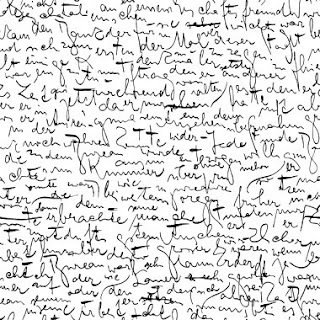 How Kathy's handwriting looks. For real! A few days before our designated face-to-face meeting, we email our pages to critique. Sometimes it’s as little as a page, but most times it’s a chapter or two. It’s important to set enough time aside to review everyone’s work, so we do email in advance if we have a large number of pages or a deadline looming. Some of us like to have comments sent via email, so we can compare notes to our current version. Some of us write comments on printed copies (what better thing to do at your son’s water polo practice or daughter’s play practice, although some of us have neater chicken scratch than others :-) (Note from Barrie: Kathy is BY FAR the messiest. No doubt she was a doctor in a past life.) We always print on the back side of used printer paper (Denny’s Chicks love to recycle). The first one to arrive finds the quietest booth in the restaurant. After ordering our skinny breakfasts, we take a few minutes to chat about our families, (Translation from Barrie: we gossip) then it’s down to business. We try to divide our time so that everyone gets verbal feedback. The nice thing about our group is that each of us seems to notice something different when we critique. Barrie is the GMC (goals, motivation, & conflict) queen. If the scene doesn’t have it, Barrie’s on our case. (in a supportive, saint-like way) Having been a newsletter editor in my pre-novel writing days, I tend to notice incomplete or disjointed sentences, odd spellings, multiple uses of the same word. Kathy picks up on continuity and can always suggest how to make a passage funny. Kelly seems to notice everything else. So as we review our work, we not only point out what we think are flaws and make suggestions on how to improve it, but also comment on what we liked about the work. If we don’t all bring pages, we might spend some time plotting ideas for our next chapter or discussing GMC. Our meeting normally lasts about two hours. Sandy, Sandy, Sandy! You didn't say that you're a stained glass artist EXTRAORDINAIRE! And that, dear bloggy friends, is Dennys' Chick Sandy Levin. Isn't she just too adorable? Before starting this week's My Town Monday's post, I want to wrap up last week's book giveaway. Congratulations to Alyson at New England Living, the winner of a signed copy of Eileen Cook's WHAT WOULD EMMA DO?! And congratulations to Paradox of Paradoxical! 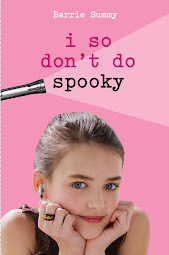 You've won a signed copy of I SO DON'T DO MYSTERIES! Email me at barrie.summy@gmail.com, and we'll get the ball rolling. Now, without further ado, here's this week's My Town Monday post. And it's rust-proof! Did you know that WD-40 was invented in San Diego? Way back when, in 1953, the Rocket Chemical Company, a little company of three people working in a little lab, "set out to create a line of rust-prevention solvents and degreasers for use in the aerospace industry." Convair used WD-40 to protect the outside of the Atlas Missile from corrosion. 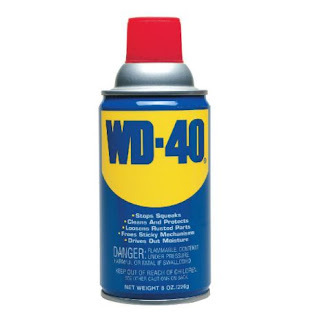 In 1958, WD-40 hit store shelves in an aerosol can. In 1960, the company boasted seven employees and sold a whopping 45 cases daily to stores in the San Diego area. In 1971, the company went public. By 1993, sales were up to a million cans/week! So, the next time you're at a fancy cocktail party and someone asks you to pass the WD-40, you can totally impress by saying, "Oh, do you mean the Water Displacement that was invented in San Diego on the 40th try?" Sepiru Chris and Junosmom list links to other My Town Monday participants. They're lending a hand while Travis Erwin, our fearless MTM leader, gets his life back in order following a recent fire that burned his house down. To help him out, please visit Habitat for Travis. Labels: Eileen Cook, My Town Monday, WD-40, what would emma do? I totally outed Child #1! My 19 year old who says things like, "I'm not a reader. I haven't liked reading since elementary school." Yes, he knows how to push my buttons. Brutally. Tonight I cracked open the door to his bedroom because I needed extra light in the hall. Lying on his bed and.....reading! A book I'd stuck in his stocking last month. I bit my tongue. I didn't comment. Didn't ask if he was enjoying the story. Didn't say, "Neener, neener, neener. See. You really are a reader, you poseur non-reader!" Nosirree, I was a mum Mom. Then, this morning, he was reading again. This time in the living room. 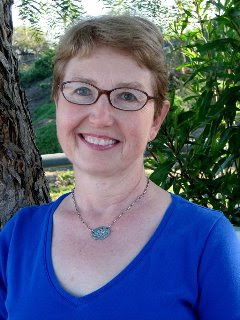 And speaking of entertaining books, I have a VERY hilarious interview for THIS WED., JAN 14 with Eileen Cook. 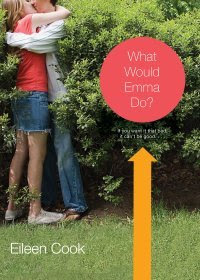 Her brand new YA, What Would Emma Do? is now on shelves. 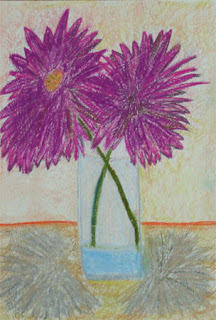 AND Eileen will post a SOMEWHAT hilarious interview with me on her blog on the very same day. AND we're each giving away a signed copy of our book to a lucky commenter and/or linker! Yesterday I drove a friend to chemo. But if you think this is going to be a maudlin post, you're wrong. It's not. This is a post about spending time with a dear friend. In a surreal situation. First, you bring a big, heavy bag packed by another friend. It's filled with comfort items like a warm fuzzy blanket, a soft sleep mask, comfy slippers, some food (dark chocolate, clementines, Saltines), a bottle of hand sanitizer, some magazines, an iPod and a laptop. The bag should have two handles so you can carry it together. To share the load. Your dear friend tells you which subjects are taboo. You honor this. Once the nurse has the IV hooked up, you get things situated with a cup of ice chips, snacks, a blanket from the warmer, the fuzzy blanket from the bag, the comfy slippers. Then you both settle in, switching gears from your fast-paced normal world of kids and chores and carpools and sports and homework. Now, it's just the two of you and an IV drip that won't be hurried. You chat. And munch. Then it's time to boot up the laptop. And now I will tell you the name of a movie that is perfect for a day like today. This is one incredibly zany British flick. Out of an entire room of people sitting in La-Z-Boy like chairs and hooked up to IVs, we were the only two laughing hysterically. And that is worth a lot. Travis Erwin is one of the truly unique voices in the Blogosphere. In his absence we must turn to Conan O'Brien for entertainment, and I don't have to tell you what kind of hardship that's going to be. For $25 you can contribute a brick toward the construction of Travis's new house. And have your name embossed for all to see. Just visit habitat for Travis. I know Erica Orloff is also involved with this effort to help Travis and his family get back on their feet. So, go forth, Blogospherians, let's do what we do best, band together and look after one of our own. 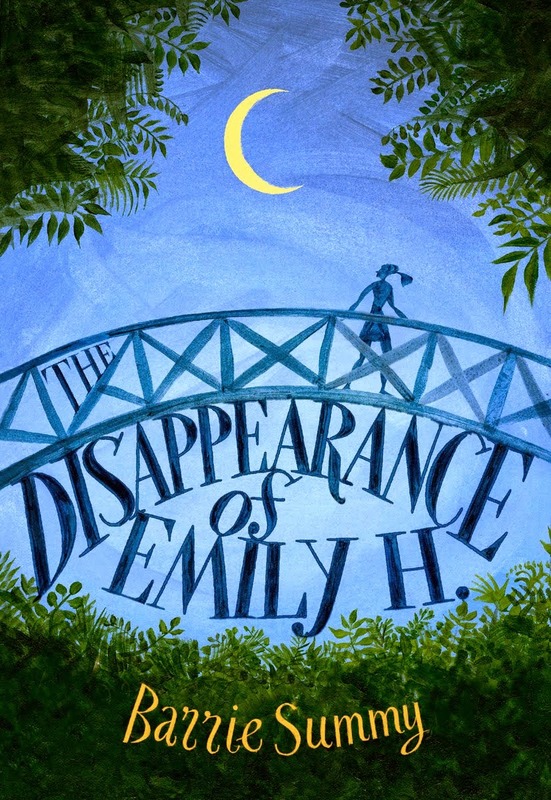 Now, abruptly changing topics, I'd like to start a monthly blog round-up for book reviews. Say, the first Wednesday of the month we each post a book review. About any genre (well, within reason. Ack!). Personally, I'll mostly do YA or Middle Grade. Then again, maybe not. I do read books for grown-ups too. :) And I have a couple of middle schoolers who'd like to write reviews. Now THAT could be fun! Let me know if you're interested by leaving a comment or emailing me (barrie.summy@gmail.com). I'll email you a reminder before Wednesday, February 4. I'll link to your review on that day. I think I'll even have a cute little widget (is that the right word?) made up for us. Ooooo. Patti Abbott at pattinase's blog does a GREAT job coordinating Friday's Forgotten Books. No doubt I'm her most erratic and unreliable contributor! Although I do love it when I get my act together and rediscover a book from my past. At any rate, I'm not as ambitious or organized as Patti and am just aiming for a book review round-up once a month about your fairly current reads. 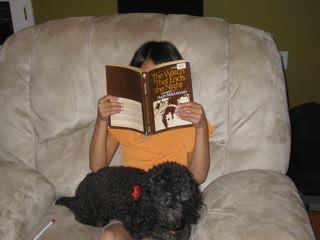 This is a picture of Child #4 reading Autumn Winifred Oliver Does Things Different! by Kristin O'Donnell Tubb, from the Class of 2k8. I promised PJ Hoover I'd put this up on Monday. I forgot to take the picture on Sunday evening before tucking in Child #4. Then I said I'd take the pic at breakfast. What was I thinking? Like our mornings are calm and peaceful enough for photo shoots??? Uh, not. It's a good day when all the kids go to school dressed. In clothes. It's a great day when the clothes are clean. A breakfast photo shoot. Yeesh. Can you believe the amount of linkage in this post? it's positively clanking! No My Town Monday posts today. Travis Erwin, brainchild of this weekly blog round-up, suffered a tragedy early Sunday morning. His home burned down. He, his wife and their two kids are all okay. And now I've passed on all the details I know. Please visit Travis' blog and offer your condolences. After dropping off Child #3 at swim practice, I plugged the 22-year-old female's address into my nav. (Got the address from the police report) Sorry, Barbara Martin, I can hear you sighing already. But, please don't despair, I didn't do anything foolhardy. Anyhoo....found the address (scuzzy apartment), found the car (dents in the front), took pictures (as neighbors watched, but didn't speak to me). Drove away. Shaking. I am not as brave a detective as my little Sherry! DH filed in Small Claims court. The 22 year old was served. Our court date is at the beginning of Feb. We found someone to help us build our little case. Hence the need for the photos. Several thank-yous are in order. First off, to Kim at It's a Maze and a Maraca for the very adorable photo of her Lizzie and I So Don't do Mysteries. Thank you, Kim! 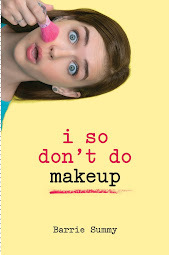 Also, shouting out to Stephen Parrish for putting up the cover of I So Don't Do Mysteries on his sidebar. One click and you're at amazon.com for ordering. Thank you, Stephen! 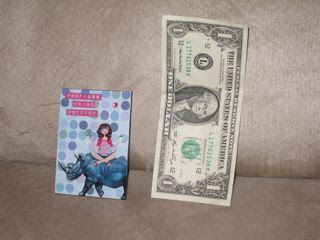 A last shout-out to Becky Levine who ordered I So Don't Do Mysteries with her holiday money and posted a pic. Thank you, Becky! 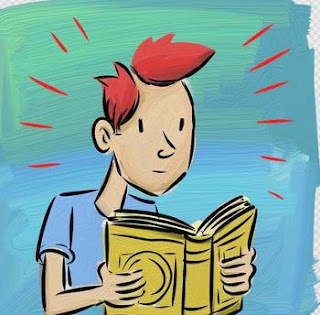 And, just in case you haven't OD'ed on the book, here's a online interview: Scott William Carter's The First Book blog. Incidentally, this is the last book interview Scott is doing. Child #2 (my 15 year old son) and I stayed up until 2:30 AM this morning reading. * Just the two of us. The house was quiet and peaceful. 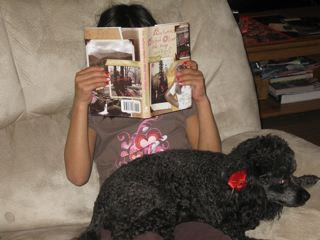 He was sprawled out on the couch; I was curled up in the La-Z-Boy with Dorothy the Dog. We made quesadillas about one o'clock, then returned to reading. I'm writing about this because it's unusual. Although Child #2 is probably the child most like me (except he's smarter and blonder and calmer), he's pulling away more and more. He'd rather be by himself or with his friends or with Child #3 (I'm so glad these two still get along so well). As 2009 opens, I find myself living with three teen boys. ** Three teen boys whose goal it is to connect less and less with me. 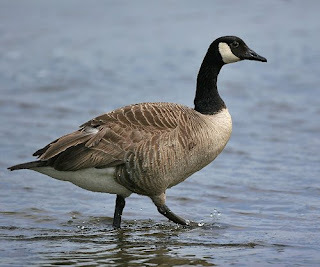 Who, quite frankly, are often noisy and opinionated and not always pleasant to be around. And it occurred to me that my New Year's resolutions are too simple; that I took the easy road. Do I need to take my vitamins daily? Do I need to exercise regularly? Do I need to return my library books on time? Yes. Yes. Yes. But I think this is the year to push the envelope with resolutions. And those resolutions are not pushing any envelopes. So...I will definitely keep the above three. I will also keep the resolution about watching a movie a month because this is a way to connect with these teens of mine. It means I often end up watching movies of little interest to me, but that's just where I am in life right now. I'm still finetuning a resolution vis-a-vis these teens. But I believe it's important to get one in there. 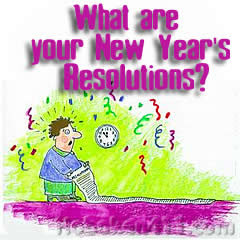 I should also add resolutions dealing with decluttering, keeping abreast of the news and providing more homecooked meals. But I'm not going to to. If I heap anymore on my New Year's plate, I'll panic and accomplish nothing. 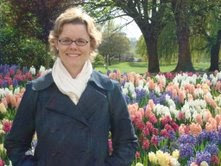 There is a really nice interview with me up on Authorlink. Susan Vanhecke did a great job putting it together. * Child #2 is reading Brisinger by Christopher Paolini. I'm reading The Hunger Games by Suzanne Collins. And, uh, Happy New Year all over again!